Sensory-seeking kids can be a challenge. In our 20 years of parenting, we’ve had more than a few wiggly-squiggly and (dare I say?) hyperactive kids. When Adalia was a sensory-seeking toddler, we had no idea what it meant or how to help. I’ll never forget the time in church, at not quite two years old, when she was hitting herself on the head with a hymn book as hard as she could…I am thankful that now that we are raising a few more sensory-seeking kids, that we have more knowledge and resources. After our weekend at Refresh last month, I came up with the idea of making a sensory-friendly bag to keep in our van. My kids with special needs have, well, special needs. And sometimes that means making accommodations in our home and family. This little travel bag is one way we are working to meet the sensory needs of all of our children. Here are the contents of the bag: gum, mini pinwheels, spaghetti ball, Crazy Aaron’s Thinking Putty, Isoflex ball and Pull, Stretch and Squeeze ball. 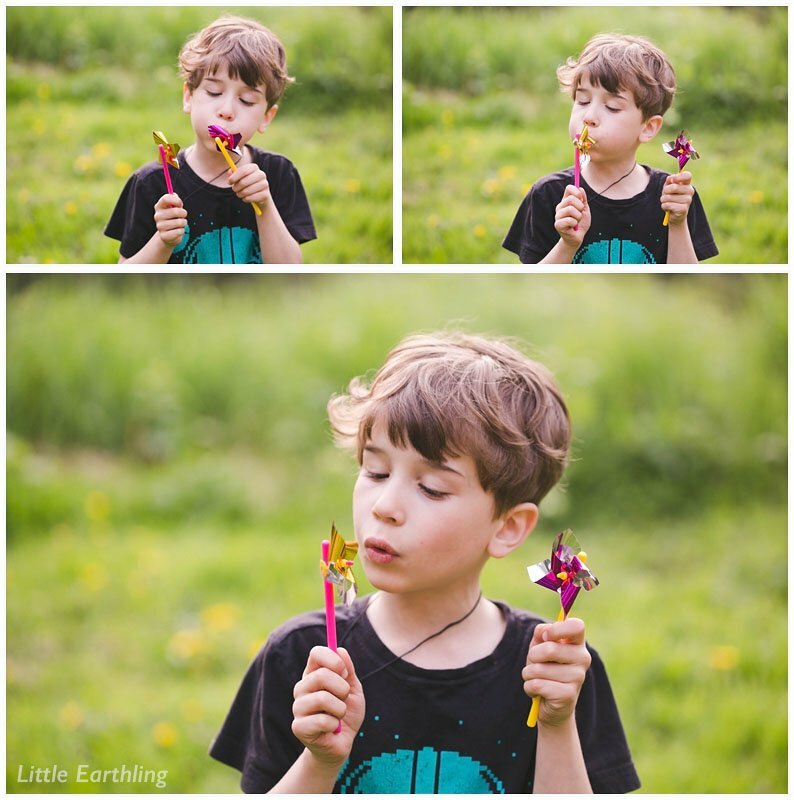 Did you know blowing on pinwheels or bubbles is excellent for regulating breathing and for relaxation? 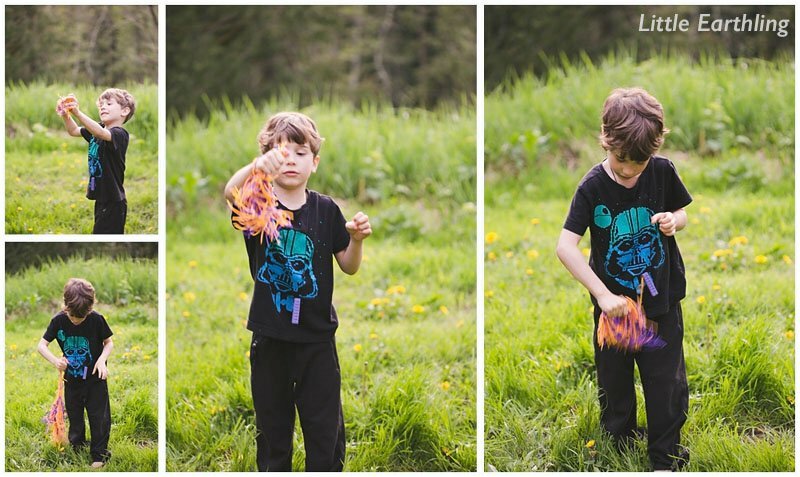 I chose to put pinwheels in my bag because they don’t make a mess or noise, but bubbles are also a great tool. And in Apollo’s case, it helps him strengthen his lungs and practice for those tricky lung-function tests! 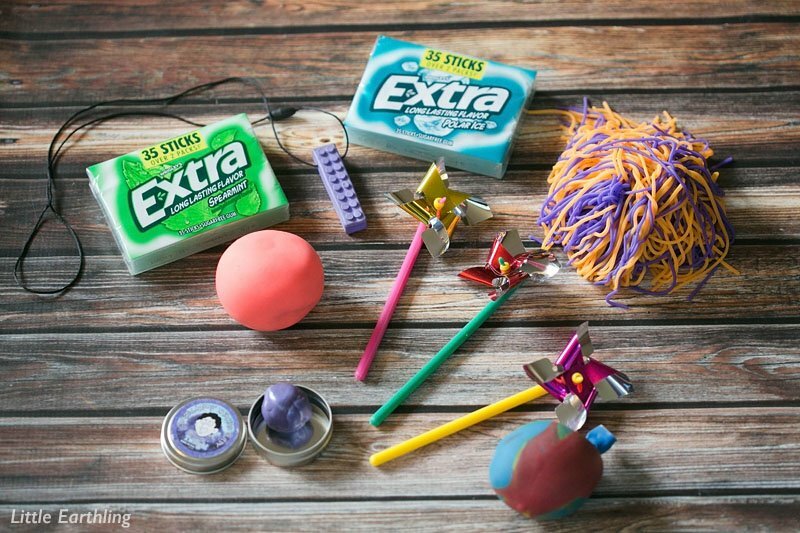 Did you know evidence shows that chewing gum can relieve stress and anxiety in kids? Yes, it does and it can even improve scores in school! We do only sugar-free gum in our house. 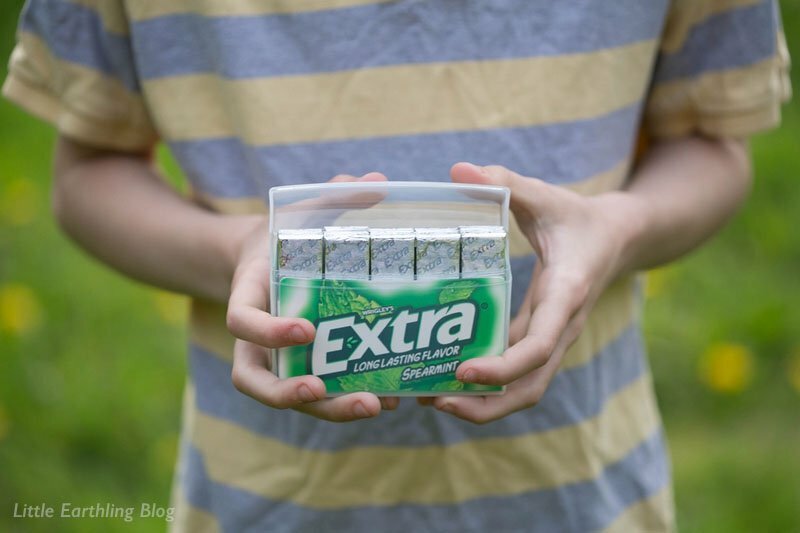 I love the new Extra® 35-stick pack. The gum comes in a durable, recycled packing and holds enough gum for even my crew. Enoch actually saves these and has his office supplies organized in them! 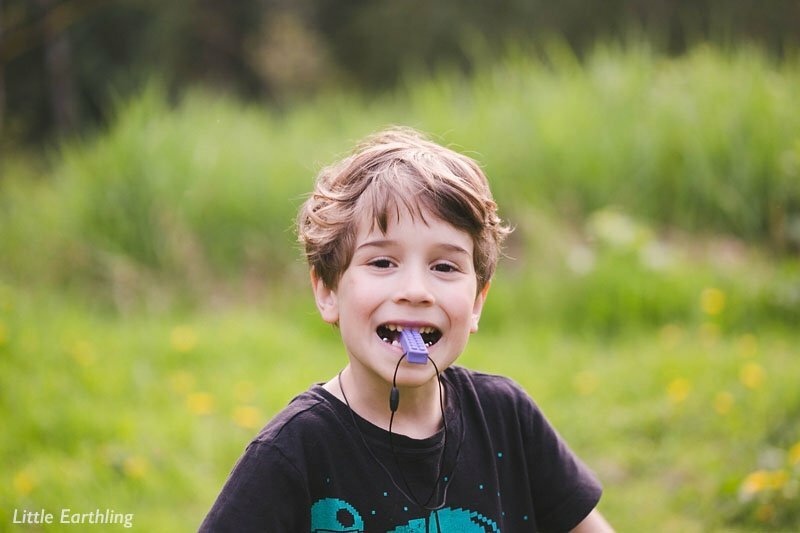 If you aren’t brave enough to add gum, try a sensory necklace. A few months ago Apollo started chewing on his shirts and I wanted to nip that habit in the bud. Enoch was a shirt-chewer and ruined more clothes than I could keep track of. I bought one of these necklaces for Apollo and one for Mordecai. Apollo’s looks like a LEGO and he loves chewing on it and Mordecai’s looks like an animal claw and is cool enough to be worn to junior high. The day Apollo wore this to school the first time, I emailed his teacher explaining what it was for. She had absolutely no problem with him wearing it and chewing on it, and it has saved his clothes! This spaghetti ball is a great sensory tool. When I bought this it had a strong chemical smell so I chose to place it outside for a few days. It is now fine and favorite of the kids. It is soft and squishy and stretchy and most of all…quiet! It also happens to be my favorite toy out of the bag. This stress ball was my kids’ favorite…I kept having to hide it so I could take pictures….This looks like a ball, but is super stretchy and just feels so…soft. I love holding this. 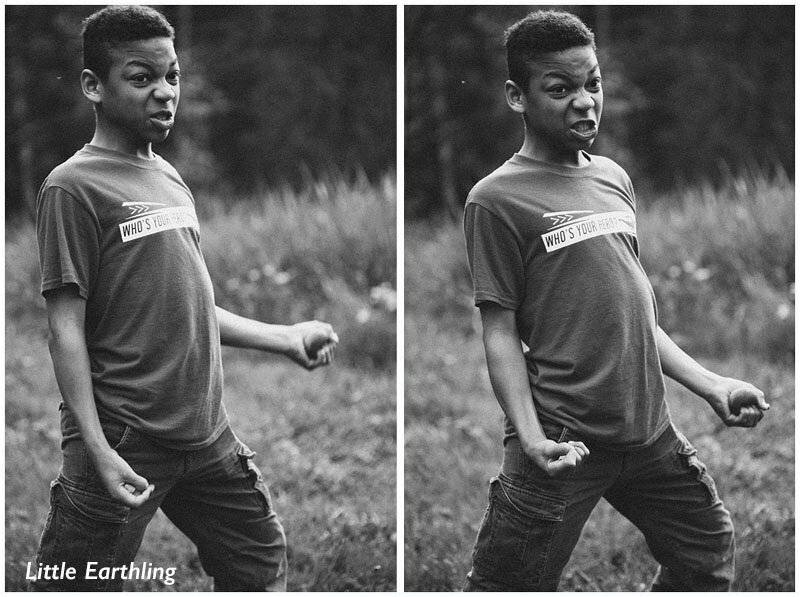 Mordecai making his “hulk face” while squeezing the IsoFlex ball. What a goof! 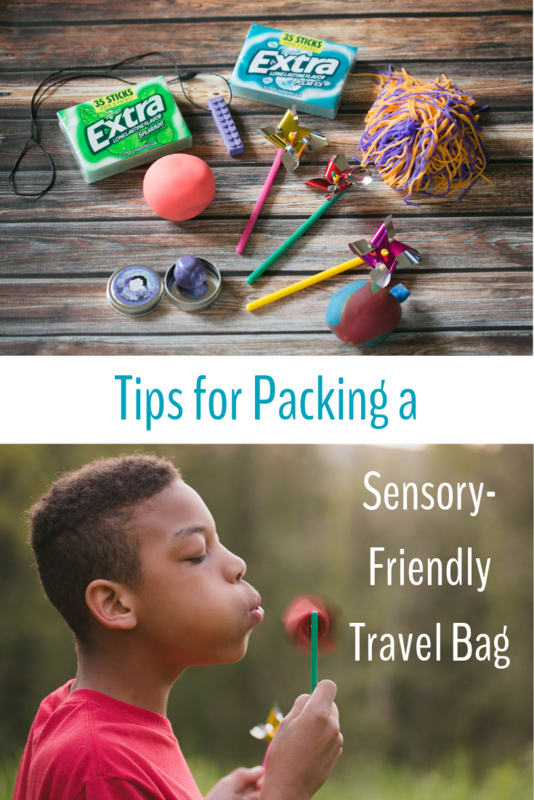 All of these items can fit in a small bag and will be used for van rides…and hopefully keep little hands busily engaged, instead of poking at nearby siblings. A smaller alternative to a full-sized weighted blanket. My son’s therapists have used these with him. They can be thrown, stuck to walls and windows, and be stuck together. These are perfect for travel and are in my Amazon cart just waiting for me to push the button. Noise cancelling headphones can be a real lifesaver for kids who are senstive to noise. We are waiting on a pair on order for my son with autism. Do you have any sensory-seeking kids? What are your favorite tips? Have any travel ideas? I love the necklace idea. Kestrel has become “chewy” lately. I think either in connection to her brother who chews and bites his lovey for comfort or as a delayed oral development phase. She’s eating better. I too was a sleeve chewers and I love the idea of her having something special to chew. We are working on mindfulness and derp breathing meditation skills and I think the pinwheels would be a great tool to add to our “angry bag” of tricks. Jasper is very much a sensory seeker and loves to chew the velcro straps of shoes. So much so that he has begun chewing on shoes of people we don’t know! While their shoes are on their feet. Now that he has most of his teeth that seems to subside. I hope some of these resources help. And as for Jasper chewing on shoes…ew! I’ve had kids do that too. Maybe he’d enjoy a teething necklace as well. Yes! My 4 year old is like this. He is always putting things in his mouth- buttons, coins, small toy, rocks… All chocking hazards all the time. I told him I would get him a teething ring if he wanted to chew on stuff so badly. And he said, yes, please, I really want one. But this is not something he can really take to school. Maybe I should give him gum? Is 4 too young for gum? Those necklaces seem like a great idea, though. Some four year old can handle gum, some can’t. I would give the necklaces a try. They have a huge selection and they don’t look babyish. I would give the gum a try at home too. Thanks for sharing! I had not heard of that site before. I used to hand out pipe cleaners to kids who wiggled in my classroom. It was silent and could be reused or tossed if needed. Some kids just need to move and create! You’re welcome! I can’t wait to take these on long drives. I think it will really help with boredom and fighting.